During 2019 the current Webnode Site will be progressively moved to this RAFA povided Website. There is the opportunity to go along for coffee and chat with fellow veterans at Sharpe’s Cafe (the First Light Charity cafe) in Market Street, Lancaster from 6.00 pm to 7.00 pm every fortnight. Next dates 2nd, 16thand 30thApril. No need to book, just turn up. 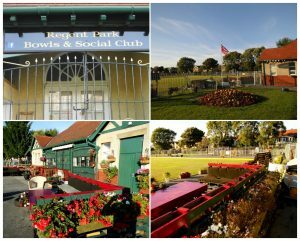 Other upcoming events from the Charity will include archery, clay pigeon shooting, football, running, social meetings and lots more. If you’ve not yet been to the cafe do go along and see what it’s like – the coffee is very good and they have some excellent cakes! It has been arranged between our Standard Bearer and Branch Chaplain that our new Standard will be blessed at the 10.00 am service on Easter Sunday, 21stApril, at St Barnabas Church, Regent Road, Morecambe LA3 1BJ. Please come along if you can to support our Standard Bearer. Over the weekend of 15 – 17 March 2019 I attended two meetings on behalf of the branch. 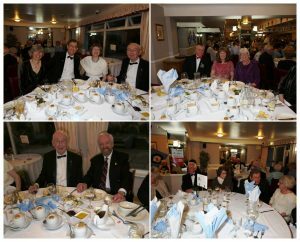 The evening consisted of a formal dinner with a singer afterwards. 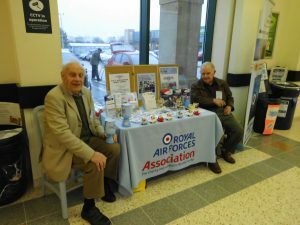 A big thank you to all of our collectors on Saturday last, we enjoyed cheerful shoppers who provided £384.46 for our Wings Appeal. US Army Airforce B-17, ‘Mi Amigo’, serial 42-31322 had been allocated the target of the airfield at Alborg, Denmark on 22ndFebruary, 1944 but was unable to drop its bombs due to cloud cover and, not wanting to kill Danish civilians, aborted the drop. The airfield was home to both Fw190s and Bf109s which attacked ‘Mi Amigo’ and left her badly damaged. She dropped her bombs harmlessly in the North Sea and struggled to return to Britain. By the time she reached the coast she was at least eighty miles off course and struggling to find somewhere to put down. 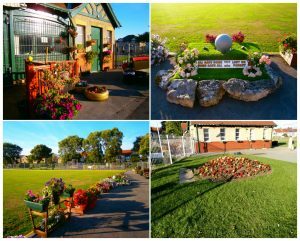 The crew spotted a grassed area in Endcliffe Park, Sheffield but the park was occupied by children playing football. As the engines failed ‘Mi Amigo’ came down in the wood to the rear of the park, killing those members of the crew who had survived the fighter attack. In total on that day 430 American airmen died and 43 aircraft were lost. Seventy five years later after a chance meeting with a BBC Breakfast presenter, Dan Walker and Tony Foulds, who has laid flowers on the site and later the memorial since seeing the crash as a child, a memorial flypast was arranged for the anniversary. I arrived just after 05:00 and the TV broadcast was mostly set up and ready to air from 06:00, taking over the entire ‘Breakfast’ programme. The café in the park had been taken over by the BBC for make-up and as the ‘green room’ for invited guests, not all of whom actual got onto the programme. Throughout the morning the crowd increased until at the time of the flypast, barely any grass could be seen. During the broadcast the usual format for ‘Breakfast’ was followed, with interviews from the sofa in the park, history snippets and cuts to the airfields preparing for the flypast. What was not shown was the short memorial service held just before the flypast. 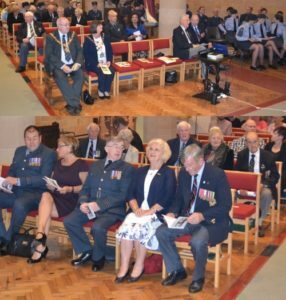 Local British Legion and ATC standards were in evidence, as were the cadets from South Yorkshire and Legion members. 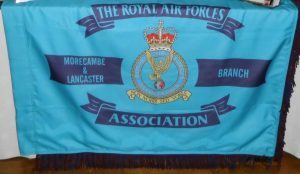 Sadly I did not see a single RAF Association standard, even though the memorial was provided by the Sheffield Branch, along with a semi-circle of ten American Oaks c.1969. However, the President of RAFA Air Marshall Sir Baz North was there representing us all. The flypast was the culmination for many and the park started to slowly empty, with the public unable to access the memorial, which had been roped off for the day. 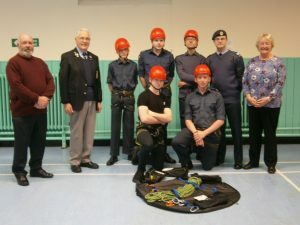 At the end of December last our Branch made a donation to 2246 (Carnforth) Air Cadet Squadron towards some climbing equipment. On Tuesday 19thFebruary three Committee members visited the Squadron HQ for a photo shoot with the cadets and staff. Together with a donation from the Freemasons, we purchased nine helmets, nine harnesses and a climbing rope. Another rope for abseiling is also on order. Sgt Joe Ashton is the staff member with responsibility for climbing and he is qualified to take the cadets to indoor climbing walls. With this equipment they will be able to climb all year round. If they can “borrow” a member of staff from 345 (City of Lancaster) Squadron who has the necessary qualifications they will also be able to go climbing on natural rock faces. 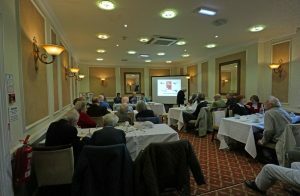 The AGM, at the Clarendon Hotel, Morecambe and former RAF Morecambe HQ, was attended by 32 members and Marc Boyle, Northern Area Branch Support Officer. The Chairman reviewed a very successful RAF100 and thanked all of those who helped and participated in a full and very busy year. 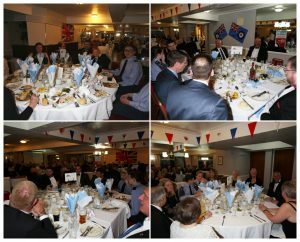 The Treasurer reported that despite the expenditure throughout the year the Branch did not have to touch the monies in the Reserves set aside for any required subsidies as the formal Dining in Night just about broke even. 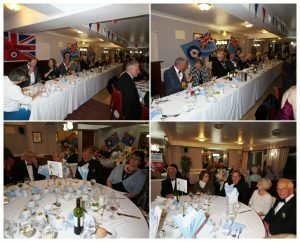 Donations and the proceeds from the Branch RAF100 concert helped. In end the Branch managed to pay out from the Year End Surplus around £1500 for a new Standard and regalia for the busy Standard Bearer, a new banner incorporating the new crest and over £500 to 2246 (Carnforth) Air Cadet Squadron for high quality climbing equipment in support of nine cadets at any time, and other items. It is amazing that we have such few members who have relations serving in the RAF. This is very sad because all that we do is focussed on gathering funds and support for serving personnel in time of need and yet their families show little to no interest. Their loved ones are in difficulties and strangers help them by collections and other activities. When they leave the service for any reason we are there to help them should they need us. Dear parents and relations of serving personnel, you don’t have to have been in the RAF to join us. 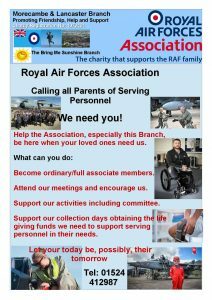 Just having someone you love or know in the RAF means you can have a Full Associate Membership at the small annual minimum cost of £8.50. If you don’t join us and as our numbers deplete, we and the funds won’t be there to provide the assistance required. Show your concern by getting in touch and join us now! 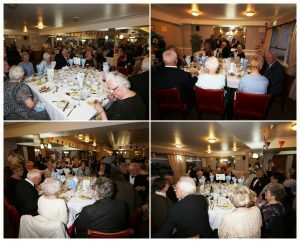 For possibly the first time since World War II, Morecambe hosted a formal RAF Dining-In Night. 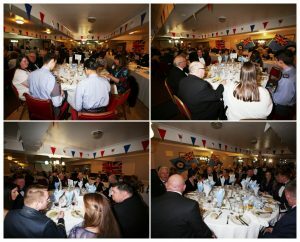 On Friday 20thApril, 115 serving and ex-service RAF personnel, honoured guests, RAF Air Cadets, families and friends sat down to a splendid meal at the Headway Hotel to celebrate the 100thanniversary of the foundation of the Royal Air Force. 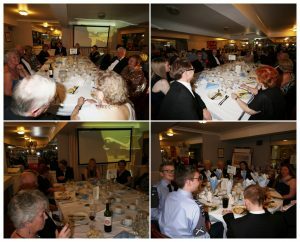 An event which had been two years in the planning was, on the night, extremely tested when a nasty crash on the M6 delayed both dinner guests and a coach party also destined for the hotel – inevitably they arrived together! 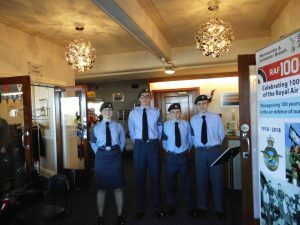 Air Cadets from 455 (Morecambe & Heysham), 1127 (Kendal) and 2246 (Carnforth) Squadrons did a sterling job of escorting guests to their tables and persuading them to part with their money for the Grand Raffle! 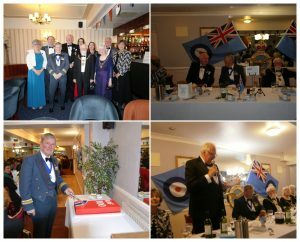 Guests heard an address by the Lord Lieutenant of Lancashire, Lord Shuttleworth, who revealed a personal connection with the RAF: his cousin, the third Lord Shuttleworth, had been an RAF pilot and was shot down off the Isle of Wight on 8thMay 1940. Lord Shuttleworth giving his address. 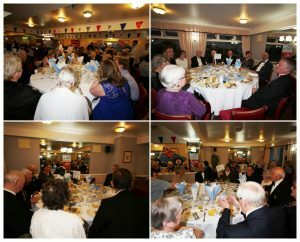 These photos show 115 guests enjoying a wonderful evening. Such events don’t happen by themselves: for this one the agreement for use of the Headway Hotel was obtained in January 2016 and planning started from then. Eyes were focussed on opportunities to invite the most senior of people for the top table. On the two days on and before the event a wonderful display of RAF activities capturing 100 years had to be put in place and we are most thankful to Squadron Leader Brian Jefferson Branch President and David Hodgson Welfare Officer for all their hard work in collecting the exhibits and displaying them. 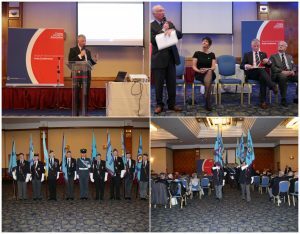 Other members had to put up all the flags and bunting, the hotel staff prepared a fitting and beautiful setting for 121 places, a video covering 100 years had to be collated and displayed and finally the RAF Air Cadets had to be briefed. All was going according to plan until a car crash on the M6 put a spoke into it all with late guests and a coach load of holiday makers collided with the people going down to dinner. Some how all was sorted out without any apparent fuss or loss of decorum. The hotel staff were just magnificent: they fed some 80 hotel guests and RAF100; the food was all up to their highest standard. Somebody just asked when were going to do this again, next week perhaps: not in our time we can tell you. 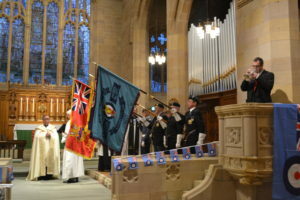 The Battle of Britain Service in St Barnabas Parish Church, Morecambe, incorporates the theme of the Few and the Many. Before the Service a silent video is shown of the main events, from the departure of the RAF in France up to the Blitz This provides the correct atmosphere for what was a very moving service.